There are many types of fish that can live healthily in a 20 gallon fish tank. 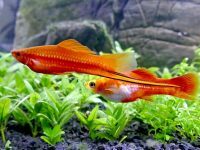 In this article, I will provide you some of the best freshwater fish as well as stocking ideas for a 20 gallon freshwater aquarium that you can apply or customize for your own setup. 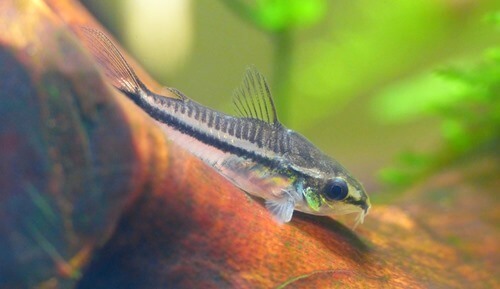 Endlers Guppies (1″), Guppies (2″), Platies (2.8″) are the best fish for starters’ small fish tanks. 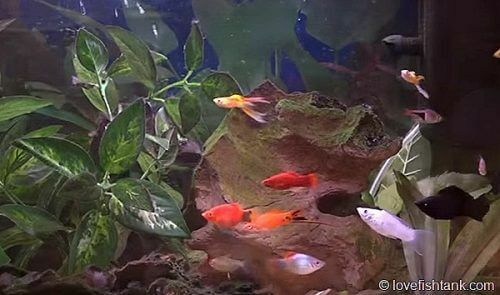 Other livebearers such as Swordtail (5″) and Mollies (4.8″) can be kept in 20 gallon tanks although a 30 gallon fish tank is better for them. Because the males of same species tend to fight each other to compete mating with the females, it is best to maintain them in groups of one male to every two females. 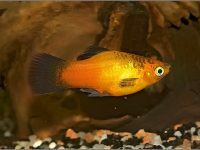 And because they are livebearers, the females get pregnant and give birth all their lifetime, a larger tank will better for them. The baby fish are very easy to be eaten by other fish; so if you want to collect any baby fish and raising them, stocking the tank with many aquatic plants, floating plants, and ornaments. 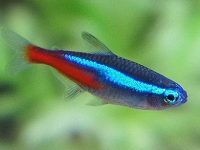 Neon tetras (1.2″), a very colorful fish, do well in a fish tank with 20 gallons of water. In nature, they live together in schools of over thousands of fish in the shallow river. They are only happy to be kept in a school of at least 5-6 fish in captive environment. In a large school of hundred specimens, they create a great view that attracts any aquarists. Neon fish are too small to invade other fish and easy to be killed or eaten by much larger and aggressive fish like angelfish. A school of many fish swimming together can help to prevent the invasion of other fish. Like neon tetra, other tetra fish such as Glowlight Tetra (1.6-2″), Black Neon Tetra (1.6″), Rummynose Tetra (2″), Black Phantom Tetra (1.8″), Diamond Tetra (2″)… are also schooling fish for 20 gallon community planted aquarium. Rasboras: Harlequin (2″), Pygmy (0.5″), Scissortail (5″), Red-lined (2.5″) Rasboras are the most excellent fish for the small community tank. They usually appear with tetra fish in community aquariums. 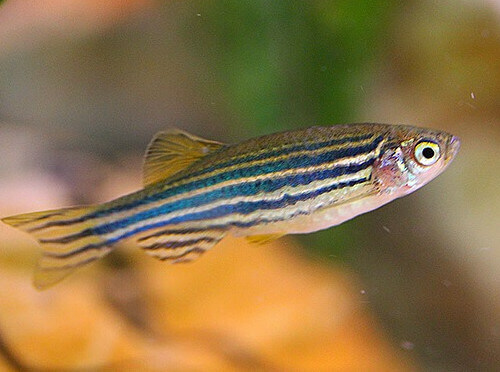 Zebra danio (2″), an active fish in upper levels of the aquarium, needs a minimum 10 gallon tank to live well but this extremely active fish will always require as more space as necessary to swim, chase each other and find food. They are schooling fish and need to be kept in a group of 5-6 or more to be happy. They sometime invade other slow long-finned fish such as angelfish, guppies and some types of surface-dwelling fish so being careful of stocking them together. 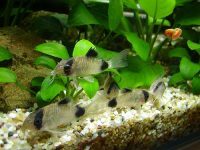 Some types of danio fish: Zebra Danio, Glowlight Danio, Gold Danio, Long Finned danio, Leopard Danio, Brachydanio rerio var. frankei, Pearl Danio, Celestial Pearl Danios, Danio marginatus, Gold Ring Danio… can also be chosen for 20 gallon tank. Cory catfish (1.25″), well-known as the bottom feeders, are very helpful in cleaning the tank stocking them. They are also loved by their habit very timid and cute, the small fish could even be kept healthily in a 10 gallon fish tank. They are very lovely and non-aggressive fish, and because of its bottom habitat, they are the good tank mates for most fish in community tropical aquarium. Remember, they are only happy to be kept together and a school of 6 Corydoras will do well. Bristlenose catfish (5″) is a good algae-eater and basically easy to keep. 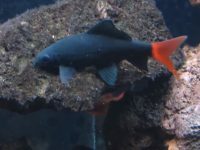 Because its maximum length is about 5 inches (12 cm) and its regular foods are algae wafers, this is one of the best algae-eater fish for the small aquarium. A baby size Bristlenose Catfish for a 20 gallon tank is sufficient, it doesn’t seem to affect your stocking ideas. 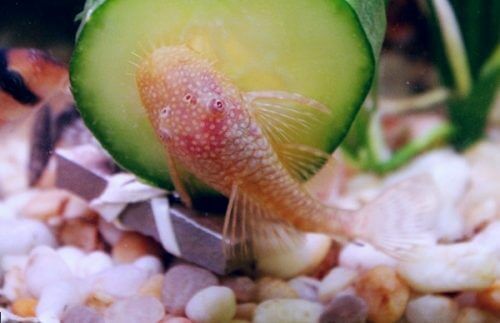 One Albino Bristlenose Catfish with its yellow color is preferred. 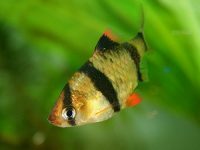 Tiger barbs (2.75 – 4″) need at least a 30 gallon tank to thrive; however, these colorful fish are sometime chosen for 20 gallon tank. They are schooling and aggressive fish so a school of five specimens is recommend for 20 gallon tank without other fish. 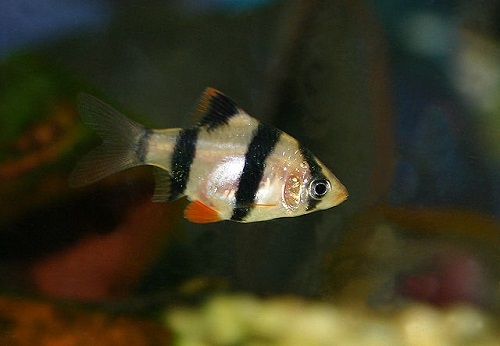 There are many types of tiger barbs with various of colors for you to choose. 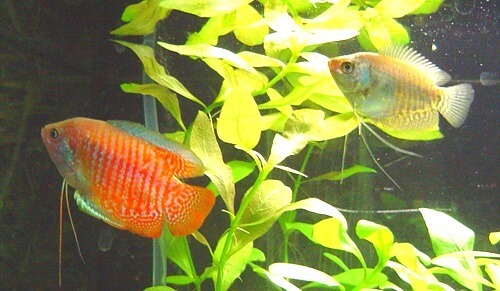 Gouramis: Dwarf gourami (Colisa lalia – 3.5″), Thick-lipped (Colisa labiosus – 3.5″) and Banded (Trichogaster fasciata – 4.7″) Gouramis are very hardy and easy to keep fish, even in small tank. These fish can be chosen as hardy fish for cycling the tank like Guppies. Small size angelfish (baby angelfish) are sometime chosen as the fish for this tank size; however, they can be a threat of smaller fish such as Guppies, Neon Tetras, Platies… Not recommended. Basing on the rule “1 inch fish per gallon of water”, a tank with 20 gallons of water can accommodate twenty of 1 inch fish. Remember that the lengths of fish in this article are the maximum ones that the fish can get only if they are kept in the best environment and caring. The lengths of fish bought from pet stores are usually smaller than the maximum sizes. Following are some stocking ideas that you can customize and apply for your 20 gallon aquarium. Livebearer combo: 3 x 2″ Guppies + 2 x 2.8″ Platies + 2 x 4.8″ Mollies. Tetras combo: 5 x 1.2″ Neon Tetras + 5 x 1.8″ Glowlight Tetras + 3 x 1.8″ Black Phantom Tetras + 1 baby Albino Bristlenose Catfish. 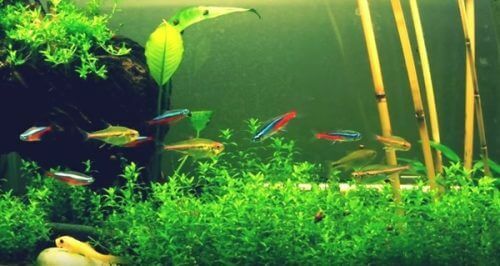 10 x 1.2″ Neon Tetras + 6 x 1.25″ Corydoras + 1 Albino Bristlenose Catfish. 5 x 2″ Zebra Danio, 5 x 2″ Harlequin Rasboras, 5 x 1.25″ Corydoras. 5 x 4″ Tiger Barbs. You can replace each other between Tetras – Glowlight Tetra (1.6-2″), Black Neon Tetra (1.6″), Rummynose Tetra (2″), Black Phantom Tetra (1.8″), Diamond Tetra (2″). Adding some snails and shrimps to the tank to create a vivid tank. Hope this guide can help you create the best aquarium as you want. If you find this article useful, please share it to your friends, thanks for reading. thank you so much for your detailed information. I do have a 20 gal tank, which I used for three hatchling turtles. I got a 55 gal for them, and decided to use the 20 gal for some fish.. The turtles are two revees and one southern painted. My grandkids are excited to help ickout fish for the 20 gal, and your information is fun and very informative for them to learn the proper way to stock the tank with fun, pretty and non aggressive pals. Thank you again!!! Thanks for the ideas. I have a male Betta and 8 Black Neon Tetras. I currently have a 20 Gallon tank and an unused 10. My future idea was put my Betta in the 10 with a few snails and add a few Cory cats to the 20 with the Tetras. But I certainly appreciate these other suggestions as well and it gives me ideas for the 20 gallon. you’re only supposed to have 15″ for a 20 gal. tank. Great article. I got a couple of Mollies and was just trying to figure out what else. Platys and Guppies it is. A pair of each. 6 in total should be enough for my 20G tank. Thank You. right beside eachother, they never nipped each other’s fins, and they never even fought over food because my beta loves bloodworms and so do the angelfish. they always say, don’t believe the internet all the time and i didn’t. i just believe that angelfish and betas are only aggressive when they have to be.